A number of you have asked about the status of the slicer. We are still testing it and making minor adjustments. If all goes as planned, it will make its first public appearance at the Buckeye Bash in Ohio in late February. One of the best things about teaching small classes in my home town is that I don’t have to cover everything in a 1- or 2-day workshop. 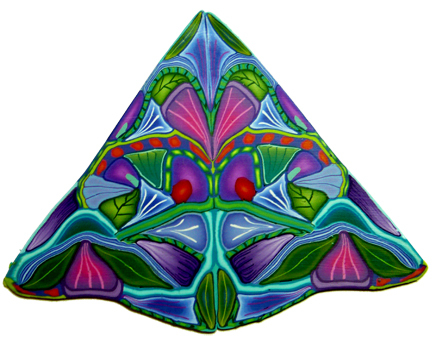 I have a group of students who are taking a series of classes leading up to one-of-a-kind kaleidoscope pendants. One of the more challenging steps for the students is combining their individual component canes into a complex cane that works well for kaleidoscopes. For most of them, this is the first complex cane they have ever built. Last weekend my latest students decided they wanted me to combine their canes for them and explain why I placed the component canes where I did as the assembly progressed. I have mixed feelings about doing so much of the student’s work for them, but because my classes are process oriented rather than product oriented, I decided to go ahead. These are the finished canes (mirrored) after Laura, Mary and Trina reduced them. I love how different the colors and designs are. Next time, they will do the entire process themselves. Any thoughts on this approach? Here is the cane Sally made in the class. I didn’t have a picture when I posted the above entry. Have an opinion on this topic? Add your comments. 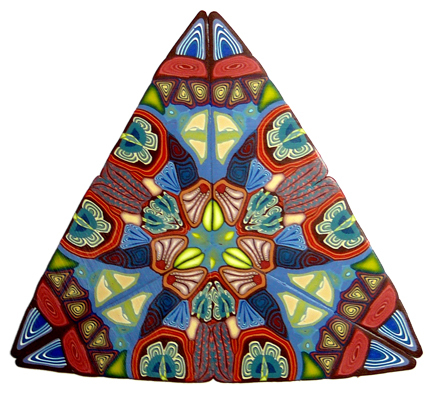 This design is from Mary’s second kaleidoscope cane. She made this cane entirely by herself after she finished her class cane. This entry was posted in Cane Slicer, Kaleidoscopes, Teaching and tagged caning, Carol Simmons, classes, Color, Color Mixing, Kaleidoscope Canes, polymer clay, Polymer Clay Classes, Polymer Clay Colorado, Polymer Clay Teachers, Polymer Clay Techniques, Polymer Clay Workshops, slicer, student work, tools/equipment. Bookmark the permalink. my thought is…i’d like to take this class myself. Thanks for your comment, Tejae. I’m clearly unsettled about this. I appreciate your point of view. My thought was that they would focus on the kaleidoscoping process which comes next, and since they are continuing students they could build the entire thing themselves the next time. I wouldn’t have done this if the process just ended with the cane, or if I were teaching a single, self contained class. I found it very helpful to watch you put my cane components together this first time around and to listen to you while you were verbalizing the decision process…but that is how I learn best. I look forward to putting my next one together myself. I might have learned as much by watching you put someone else’s cane components together from start to finish and then doing mine myself, but either way…I think watching you do that step once was very helpful. I look forward to the slicing and kaleidoscoping! I think the solution is for me to have my own cane components to assemble while students watch. Discussing the pictures didn’t seem to be enough. 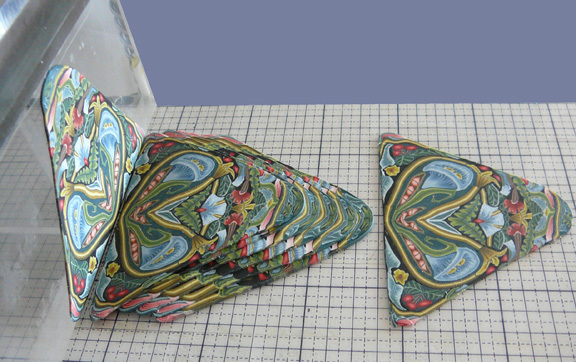 Considering the cost of classes and the amount of time invested, I was very grateful for Carol’s hands on involvement. To have the first attempt a success makes it a HUGE encouragement to continue with future projects. This is something that I can feel good about gifting for the holidays. I am not taking this for a grade for future employment. I am taking it to learn if there is a new medium that I would enjoy working in. After this series of classes, I will continue. Carol’s process brings together so many complex elements, from learning to mix colors, to obtaining the right balance of colors, to using skinner blends to create elements that will blend together into a bigger cane. It would all be too overwhelming to complete without the support Carol provided. I appreciate all the notes Carol provided with examples of different approaches. But it is very different to watch your canes being assembled and to find out how much the final appearance is affected by using the same element several times reduced into smaller elements and giving a very different appearance each time. I watch each cane being assembled, and learned from both the assembly of my cane as well as the others. Each was a learning experience. Thank you Laura. I appreciate your enthusiasm and support. I was going to say that one of the best teaching components of the class was Carol taking our different color schemes and sets of component material and constructing the final canes. I learned a great deal from each cane construction. Given the time limitations of the class (and this was an intense class), I thought Carol’s construction of several different canes was much more useful than our doing our own. We wouldn’t have confronted the range of problems/solutions/manipulations presented by the different canes. The only problem I see with this approach is that Carol won’t be able to do it in a larger class and will probably have to demonstrate on only 1 cane. But back to the best part business…there were too many other really good parts to this class (as Laura mentioned). It was a course in color, a strategy for developing color combinations (using the pictures), how to produce the colors you want to use, how to put the colors/textures together, how to work w/ the clay…and probably more that I haven’t realized yet. It was alot to pack into 2.5+ days. We were lucky to have only 4 students which allowed Carol to do hands-on instruction. P.S. I have constructed a cane from the hodge-podge of class leftovers. It worked ok. Thanks, Mary. What I hope to do when I travel outside of Colorado is teach this process in 6-day workshops to small groups (6- 8 people, 10 at the most) and have plenty of time for each step. With that amount of time I could help students think through the construction of their complex canes individually if they asked for help. They could do all the construction themselves. I doubt any of the groups would be all beginners as yours was, so not everyone would need or want this help. Not many people have done these smaller, longer, workshops – I hope the interest is there. I was very thankful for the help I received from Carol. It helps me greatly to watch the master in action. I’m very slow and still wouldn’t have a complete cane. My thought for a larger class would be to have canes prepared so the students could watch while a complex cane is being put together. Just my two cents after reading other’s comments. I am self-taught from available resources. Initially online, then books and eventually DVD’s. By the time I got to the DVD’s I was familiar with most of the processes. What one is not familiar with is the experience in putting components together successfully in a complex cane when starting from scratch. One can start from a drawing or take a more random approach. I don’t know how you started the process with your students – I assume no drawing, as they would have known what goes where. When I watch a class on DVD, there are lots of little details, which make the difference to achieving a satisfactory outcome and I think watching someone put together a few complex canes from bits and pieces, talking all the while about what and why may work or not would be inspirational and instructional. It may be the defining moment of the process. The question is, who’s canes should be used, so students have an opportunity to contemplate their own options. With this in mind, I think it may be an idea to start with larger initial canes, so students can watch you putting one together as well as finding their own way. Alternatively you can explain the entire process by demonstrating with your own canes. They need to learn the concept of the size of individual elements and how blends and contrast layers reduce relative in size to the entire cane. Considering that they will return for another session to do it all from scratch again, I think, be guided by your student’s wishes – and they may vary. Give them a choice from the start and you have the best of both worlds. Thank you for your well thought out comments Sabine. I’m still conflicted about this one, but I don’t think I’d do it the same way again. We looked at lots of pictures of canes and talked about the designs – what worked and what didn’t, but that isn’t the same as constructing them. I should have had my own cane to assemble, but I didn’t. I think I learn as much from teaching as my students learn from me! I am an experiential learner when it comes to canes. I learn from the decisions I make that do or don’t work. I also learn from critiques of my work. Plus, I continue to learn about my own canes by watching the decisions others make when putting together kaliedoscopes from my canes that look very different than what I have made with my canes. Whether starting with a demo or hands-on assistance, work goes through a maturing process. It would be interesting to compare notes on how “second-cane-assembly” differed for students of the first and second classes. Who found it easier? Did seeing more examples benefit people more than experience? How motivated are students from each class to work on their own? Thanks for pointing out how much learning styles can differ. Your post also reminds me how different the dynamics of classes can be. Most of the first group (your class) couldn’t wait to jump in and start building their complex canes. The second group may have been more cerebral or analytical and wanted my help in understanding the thought process I go through when I construct a complex cane. The kaleidoscopes from both classes are beautiful. I have been a teacher (not of polymer clay) for over 20 years of all ages, and my experience is that you might be worrying too much about this idea. I believe that learning and teaching takes all forms and mostly comes out of the simultaneity of the the teaching moment. In the scheme of things, hopefully these ladies will make many, many canes in their exploration of polymer clay and you fashioning one of their canes while talking through your process is but a fleeting moment in their journey. I liken it to teaching our children to cross the street. In the beginning we carry them, then hold their hand, then eventually peek out the window to watch over them even as they are practiced enough to do it on their own. Granted, adults are not children, but we all learn from guidance, practice, exploration and even making mistakes. Personally, since I am not able to take your classes because I live a state away, I am envious of that hands on approach. I study your designs carefully, but they can’t speak to me of your process since I am still a beginner. So I make a lot of mistakes. I’d love to have more guidance. I wouldn’t always want it, but what you did with the class is respond to the needs of your students, and this student has the same need, so I say, be more confident in your teaching decision. Sounds like a great strategy to get folks started the great journey of kaleidoscope caning, crossing one street at a time. I replied to this previously (or attempted to – I’m still figuring out this blog stuff) but I don’t see my reply on the site so I’m writing again. I’ll feel kind of silly if there are two. Thank you for your comments and your encouragement. I love your analogy of teaching a child to cross the street. The reason I post these musings is that I enjoy getting different perspectives on issues I am pondering myself. I’ve been extremely gratified by the number of very thoughtful responses I’ve gotten and yours is certainly among them. Once again you remind me that the each class is unique in their needs and abilities. I’m fortunate to teach small classes (at least locally) so I can respond to individual learning styles. After watching a couple of DVD classes, I noticed that it was easier at times to just use the same components as as instructed and focus on the process and techniques rather than the creative side (in your case colour mixing and cane creation) of things. If you have larger classes and time limits, getting everyone to create the same components and then taking those and assembling them in a range of different ways may be far more beneficial learning process than dealing with everyone’s colour combinations as well. Colour studies may need to be a separate class – or a prerequisite class if possible. Be guided by your student’s – that’s often the best way forward. Be flexible – as they may have differing wishes and needs. I think flexibility in teaching works well in small classes, bigger ones require more structure. When the slicer is available, please write to me and I’ll give you a credit card or mail a check in advance. Thank-you for passing the art and teachings! I put you on my list. Carol, I have been dreaming of your slicing machine lately. I would love to be one the list for one when they become available – or are they already? How do you accommodate round canes? I have some ideas but wondered what you have done along those lines. Karin, I have you on the list but there are at least 10 people ahead ovf you. I’ll keep you posted.